(Newser) – A 16-year-old won a boys' high school golf tournament in central Massachusetts with a commanding four-stroke lead, but the teen didn't advance to the state championships or, in fact, take home the first-place trophy. 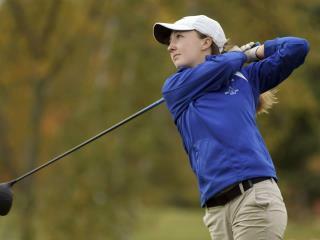 That's because while Lunenburg High School junior Emily Nash was allowed to play in the regional boys' team tournament Tuesday—where her team failed to make the cut for the state team tournament—as a female, she is barred from competing with boys as an individual under Massachusetts Interscholastic Athletic Association rules, per the Guardian. The Worcester Telegram explains her high school has no girls' team, so MIAA rules let her play on the fall boys' team, but only as a member of the team, not as an individual. She should have simply claimed she identified as male. See? This is why we should have an all female military. Draft only women. Even if we lose a war we can say, "Yeah? But you beat a bunch of women!!!" Seriously, way to go girl. Stay focused on your sport and continue your winning ways. Hope to hear a lot about you in the future. Why even let her play if she wasn’t allowed to win?